MEET Izzy the Labrador — one of the dogs helping to keep Australia Foot and Mouth Disease-free. 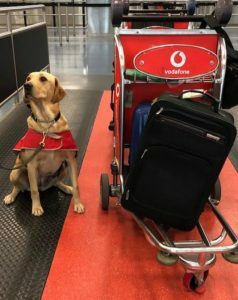 Biosecurity detector dog Izzy is part of the Sydney Airport biosecurity team where some of the recent detections of products containing African Swine Fever and FMD virus fragments were found. The Australian Government Department of Agriculture and Water Resources sources its detector dogs from the Australian Border Force breeding program. That program provides a reliable source of suitable Labradors which then undergo an eight-week biosecurity detector dog training program. 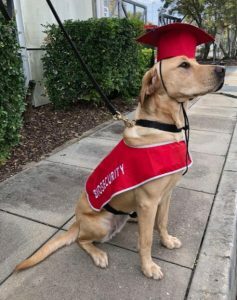 Izzy was born on 16 October, 2016, and graduated our training program in May 2018. In a single month Izzy can make upwards of 100 detections. In January 2019, Izzy made 109 detections of undeclared biosecurity risk material including fresh produce and meat products, which were then forfeited to our biosecurity officers. This included 31 different meat products such as beef, pork, poultry and salami. Every dog has their day and Izzy recently had her biggest yet — detecting over ten kilograms of undeclared and illegally imported fruit and meat products in a passenger’s bags. Head of Biosecurity, Lyn O’Connell, said the passenger had put Australia at risk, as meat products can carry a range of diseases, including Foot and Mouth Disease. 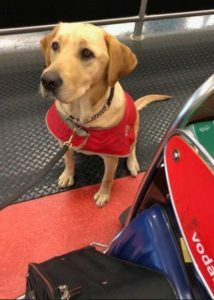 “Izzy was doing some routine sniffing when she responded to a passenger’s bag and our biosecurity officers soon found out what had caught her nose. 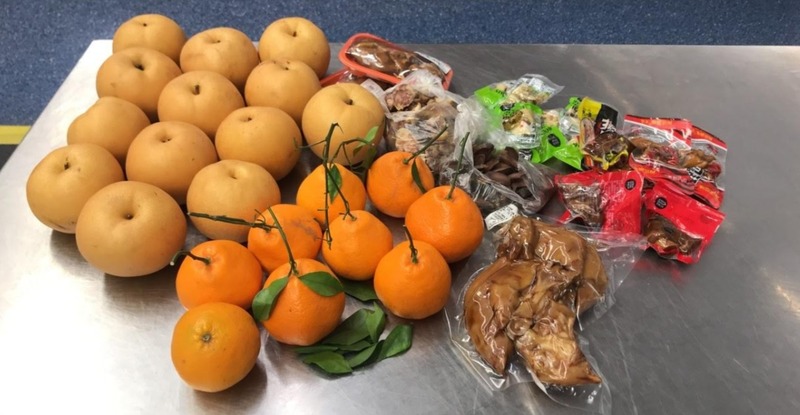 “They found almost 8 kilos of nashi pears, 2 kilos of oranges, 325 grams of chicken meat and more than 2 kilos of pork products that included pig meat, sausages and trotters,” Ms O’Connell said. “There is no excuse if you bring these or other biosecurity risk items to Australia. If it arrived in Australia, FMD could cost Australia’s economy billions and take a decade to eradicate. Fragments of FMD and ASF were recently detected in pork products intercepted at Australia’s airports and mail centres, so the risk is real. Ms O’Connell said the dogs do a great job sniffing out potential risk items, but every passenger that travels to Australia has an obligation to follow our conditions. For more information on items that should not be brought to Australia, visit agriculture.gov.au/travelling. Great work Izzy. It’s a pity your bosses aren’t as good as you. Destroy the products they bring in. If they are foreigners, put them back on a plane to their country of departure. If Australian, minimum $50,000 fine and a 12-month jail term. You will never stop this until we get serious about these people. To discover both ASF and traces of Foot and Mouth Disease is just disastrous to this nation for all of us, not just the farmers. As the judiciary across Australia is so weak that they give trespassers $1 fines and they are free to do it again. It would be a totally different story if the farmers took a 100 supporters and intruded on their private properties, stole their dogs and stuck their noses up to the law as these minorities do. The penalty is not great enough for the crime. Minimum should be at least a $50,000 fine. No excuses.